We are excited to announce the Grand Opening of Villa la Esperanza Apartments (VLE), a rehabilitation project located at 131 S. Kellogg Avenue in Goleta, for December 11. VLE was originally constructed in 1971 with the driving force of Michael Towbes behind it as the builder and the Goleta Valley Housing Committee owning and managing the property. With a change of ownership to PSHH, VLE underwent a major rehabilitation to increase the number of rental units and also add a 5,000-square-foot, two-story building that includes a learning center, community room, full community kitchen and new laundry facilities. Other additions include two playgrounds, barbecue area, and offices for administration and resident services. At the Grand Opening, PSHH will also celebrate the lifetime of service of Frank Renda. During his more than three decades on the Goleta Valley Housing Committee, Frank Renda was an ambassador for safe and well-kept affordable housing that enriched the lives of residents old and young. As one of the longtime stewards for the development of Villa la Esperanza Apartments, Frank helped ensure its preservation, continuity and expansion. PSHH is proud to rededicate the Community Room to such a deserving individual. 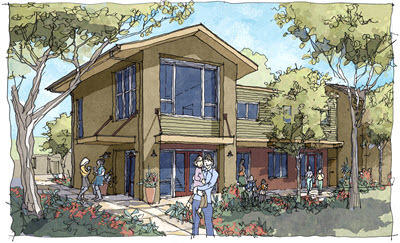 Funding partners include Goleta Valley Housing Committee, Citi Community Capital, Merritt Community Capital Corporation, and U.S. Department of Housing & Urban Development. Development partners include architect RRM Design Group, Civil Engineer Stantec, Inc., landscape architect Robert Andrew Fowler and creative partner Interiors by Adele. Community Partners include Boys & Girls Club of Goleta. The RSVP deadline has past. Subscribe to receive future event e-vites from PSHH.